Objectives: The present study was undertaken to investigate the oxidative damage, the biochemical and histopathological changes in the pancreas of the Wistar rats which was fed high protein diet and the recovery after the oral administration of the n-hexane extract of the herb, Emilia sonchifolia. Materials and Methods: The rats fed with high protein diet for a period of 30 days and treated with n-hexane extract of Emilia sonchifolia (250 mg/kg body weight). Body weight, pancreatic weight, serum amylase, lipase, aspartate transaminase, alanine transaminase, urea, uric acid, creatinine, DNA and RNA content of the pancreas, pancreatic enzymatic and non-enzymatic antioxidants such as superoxide dismutase, catalase, glutathione peroxidase, reduced glutathione, and vitamin C were evaluated. Results and Discussion: At the end of the study the rats gained less body weight and showed a significant (P < 0.05) increase in serum levels of amylase, lipase, aspartate transaminase, alanine transaminase, urea, uric acid, creatinine, tissue DNA, and RNA content and showed a significant (P < 0.05) decrease in the pancreatic antioxidants. Treatment with the n-hexane extract ameliorated the damage caused by high protein diet. This was also evidenced by histopathological studies. Conclusion: From the results, it was suggested that the n-hexane extract of Emilia sonchifolia has an effective medicinal property and can act as a pancreato-protective herb. The organ in greatest danger is pancreas and the normal operation of its function is essential for the digestion and absorption of nutrients. Nutritional imbalance can cause deleterious effects and may be one of the causative factors of oxidative stress. They cause redox imbalance and further lead to a number of diseases produced through accumulating reactive oxygen species (ROS) in vivo. Earlier studies have confirmed that pathogeny of acute pancreatitis, which is one of the diseases with higher incidence, is attributed to the oxidative damage of free radicals on endocrine and exocrine function of pancreas. , Herbs play an important role in the absorption and digestion and also have been used as a food and for medicinal purposes for centuries. Existing remedies from folk medicine should be rigorously examined for potential relevance in the treatment of disease, and it is an alternative solution to allopathic medicine embodied with severe side effects. In plants, terpenoids occur in nearly all natural food and represent a chemical defense against environmental stress and provide a repair mechanism for wounds and injuries. Terpenoids were evaluated for their potential antineoplastic activity in various human cancer cell lines such as gastric, pancreatic, and colon carcinomas. Effective ingredients in several plant derived medicinal extracts are terpenoid compounds of mono, di, sesqui, tri, and tetraterpenoid groups. One such folk medicine is Emilia sonchifolia in which only the n-hexane extract of the plant showed the presence of terpenoids in high concentration. Emilia sonchifolia is an edible plant used in the ayurvedic system of medicine for the treatment of gastropathy, diarrhea, opthalmia, nyctolpia, cuts and wounds, intermittent fevers, pharyngodyma, and asthma. The aqueous and the methanolic extracts of the leaves of Emilia sonchifolia progressively exhibit antitumour activities. The n-hexane extract of Emilia sonchifolia (250 mg/kg) has anticancer effect and rich in terpenoids. With these backgrounds, the present study was undertaken to its medicinal property against pancreatic damage in Wistar rats fed high protein diet. Emilia sonchifolia was collected from Thrissur, Kerala, India. The plant was authenticated by Dr. G.V.S. Moorthy, Botanical Survey of India, TNAU Campus, Coimbatore. The voucher number is BSI/SRC/5/23/09-10/Tech/782. Fresh plant material was washed under running tap water, air-dried and powdered. The powder soaked in n-hexane solvent was kept in the shaker for 48 h at room temperature. The extract was collected and concentrated at 40°C under reduced pressure using rotary evaporator. The dried extract was stored at 4°C until further use. The remaining residue was extracted again with the fresh solvent to ensure complete extraction. Soybeans purchased from the local store, Coimbatore was powdered by using electronic blenders and stored in an airtight container. The male wistar rats weighing between 50 and 55 g were obtained from Animal house of Karpagam University, Coimbatore. The yet weaning animals were caged in well-ventilated hygienic conditions. At the beginning of the experiment they were given a normal food for a week. After this adaptation period, they were divided randomly into four groups each containing six. The study was approved by Institutional Animal Ethical Committee (IEAC) constituted for the purpose of CPCSEA, Government of India. Group II: Rats fed high protein diet (100% raw soy flour) for 30 days. Group III: Rats fed high protein diet (100% raw soy flour) were treated with n-hexane extract of Emila sonchifolia (250 mg/kg body weight for 30 days). Group IV: n-hexane extract of Emilia sonchifolia alone (250 mg/kg body weight). After the experimental period of 4 weeks, the animals were sacrificed under light chloroform anesthesia. The blood was drawn from the para-orbital venous complexes and serum separation tubes, allowed to clot for 30 min at room temperature and then centrifuged at 1000× g for 10 min and stored at 4°C. The biochemical parameters such as amylase,  lipase,  AST, ALT,  urea,  uric acid,  and creatinine  were estimated. The pancreas were excised immediately, cleaned free of extraneous material and perfused with ice cold saline (0.9%) and stored in 10% formalin, which are used for the antioxidant and histopathological studies, respectively. The nucleic acid DNA and RNA were extracted from the tissues. One hundred mg of tissues were homogenized in 5 ml of 10% TCA was added to allow complete precipitation of protein and nucleic acid for 30 min. The mixture was centrifuged for 10 min at 5000 rpm and the precipitate was washed thrice with 10% ice cold TCA to remove any soluble compounds. Lipid peroxidation (LPO)  was calculated on the basis of the molar extinction coefficient of malondialdehyde (MDA) and expressed in terms of nanomoles of MDA/mg protein. The enzymatic antioxidants such as superoxide dismutase (SOD),  catalase (CAT),  glutathione peroxidase (GPx)  and the non-enzymatic antioxidants such as reduced glutathione  and vitamin C  were evaluated in the pancreatic tissue homogenates. The results obtained were expressed as mean ± SD. The Statistical comparison among the groups were performed with one way ANOVA and DMRT using a statistical package program (SPSS 10.0) at P<0.05. The body weight gain of the rats fed with Raw soy flour (Group II) was significantly lower when compared to Group I normal rats. The gain in body weight and feed utilization efficiency are lower in rats fed with high protein diet which might be because of poor digestion, decreased food intake by rats and thus results in weight suppression. In contrast, the pancreatic enlargement was observed in Group II rats fed Raw soy flour and it was significantly greater than the Group I normal rats [Table 1]. It was reported that  raw soybeans had a growth depressing effect in rats and also caused pronounced growth of the pancreas and stimulated pancreatic enzyme secretion. Administration of Emilia sonchifolila significantly (P < 0.05) brought back the body weight and the pancreatic enlargement to its normal levels. The markers most commonly used to diagnose pancreatic damage include serum amylase and serum lipase levels; a level two to three times the upper limit of normal indicates a pancreatic attack. An elevated amylase and lipase is observed in Group II rats fed with high protein diet which is an evidence for pancreatic damage [Table 2]. Our findings also include increase in the serum aminotransferases (AST and ALT) in Group II rats above that of the Group I control rats [Table 3]. High-protein diets are designed to induce ketosis, a condition that occurs in uncontrolled diabetes mellitus and starvation. When there are not enough carbohydrates in the diet to provide glucose to the cells that rely on it as an energy source, ketone bodies are formed from fatty acids. An increase in circulating ketones can disturb the body's acid-base balance, causing metabolic acidosis, which can lead to hypophosphatemia, resorption of calcium from bone, osteoporosis, and kidney stones. High-protein diets are associated with reduced kidney function, which, over time, can lead to permanent loss of kidney function. These diets are associated with a significant decline in kidney function. Excessive protein ingestion can increase amino acid oxidation and urea synthesis. High protein intakes provide a greater uric acid load to the kidney. Despite increases in urinary uric acid excretion, increases in serum uric acid are observed [Table 4]. Treatment with the n-hexane extract of Emilia sonchifolia significantly (P < 0.05) restored the serum enzyme levels, urea, uric acid, and creatinine to its normalcy. A high-protein diet could destroy ROS in the digestive gland. The pancreas is an important glandular organ in the digestive system and the normal operation of its function is essential for the digestion and absorption of nutrients. Moreover, many studies have confirmed that pathogeny of acute pancreatitis, which is one of the diseases with higher incidence, is attributed to the oxidative damage of free radicals on endocrine and exocrine function of pancreas. The synthesis of DNA and RNA needs a large amount of ATP to synthesize purine and pyrimidine and activate amino acids, and the ATP-generating process is accompanied by free radical production, so that oxygen free radicals are excessively produced, which is the possible reason for oxidative stress induced by the excessive protein diet. In this study, the results indicates that a high protein diet could stimulate cell differentiation and growth, and promote synthesis of DNA and RNA in pancreas of Group II rats fed high protein diet. The DNA and RNA content in pancreas of Group III rats was found to be significantly (P < 0.05) decreased when compared with Group II rats [Table 5]. The high protein diet caused a remarkable change in antioxidant mechanism by increasing the process of lipid peroxidation and decreasing the activities of SOD, CAT, GPx, reduced glutathione and vitamin C in Group II rats where as treatment with Emilia sonchifolia significantly (P < 0.05) decreased the lipid peroxide content and enhanced the antioxidant activities in Group III rats. This shows that the n-hexane extract of Emilia sonchifolia protects the pancreas from the oxidative stress induced by high protein diet [Table 6] and [Table 7]. The present study is performed for the first time to elucidate that Emilia.sonchifolia can act as a natural antagonist and be called as a pancreato-protective herb. Further studies are required to determine its particular terpenoid group and also the active constituent which may lead to the development of natural plant based medicine. We, the authors, are thankful to our Chancellor, Advisor, Vice Chancellor and Registrar of Karpagam University for providing facilities and encouragement. 1. Matthews D. Proteins and amino acids. Modern Nutrition in Health and Disease. In: Shils M, Olson J, Shike M, Ross AC, editor. Baltimore: Williams and Wilkins; 1999. p. 11-48. 2. St Jeor ST, Howard BV, Prewitt TE, Bovee V, Bazzarre T, Eckel RH, et al. Dietary protein and weight reduction: A statement for healthcare professionals from the nutrition committee of the council on nutrition, physical activity, and metabolism of the American Heart Association. Circulation 2001;104:1869-74. 3. Blokhina O, Virolainen E, Fagerstedt KV. Antioxidants, oxidative damage and oxygen deprivation stress: A review. Ann Bot (Lond) 2003;91:179-94. 4. Luthen R, Niederauc C, Kotb M. Intrapancreatic zymogene activation and level of ATP and glutachione during caerulein pancreatitis in rats. Am J Physiol 1995;268:G592-604. 5. Hao YL, Wen QS. Effects of octreotide on endothelin and oxygen free radical in acute necrotizing pancretitis in rats. Chin J Crit Care Med 2001;21:596. 6. Craig WJ. Health promoting factors of common herbs. Am J Clin Nutr 1999;70:491S-9S. 7. Rao VG, Kumar S, Islam M, Mansour SE. Folk medicines for anticancer therapy- a current status. Cancer Ther 2008;6:913-22. 8. Lage H, Dvarte N, Coburger C, Hilgeroth A, Ferreira MJ. Antitumor activity of terpenoids against classical and atypical multidrug resistant cancer cells. Phytomedicine 2010;17:441-8. 9. Salimen A, Lehtonen M, Suuronen T, Kaarniranta K, Huuskonen J. Terpenoids: Natural inhibitor of NF kB signaling with anti-inflammatory and anticancer potential. Cell Mol Life Sci 2008;19:2979-99. 11. Shylesh BS, Padikkala J. In vitro cytotoxic and antitumor property of Emilia sonchifolia (L.)DC in mice. J Ethnopharmacol 2000;73:495-500. 12. Shylesh BS, Ajikumaran Nair S, Subramoniam A. Induction of cell-specific apoptosis and protection from Dalton's lymphoma challenge in mice by an active fraction from Emilia sonchifolia. Indian J Pharmacol 2005;37:232-7. 13. Gomori G. Assay of serum amylase with small amounts of serum. Am J Clin Pathol 1957;2:714-6. 14. Cherry IS, Crandall JR. The specificity of pancreatic lipase: Its appearance in the blood after pancreatic injury. Am J Physiol 1932;100:266-73. 15. Reitman S, Frankel SA. Colorimetric method for the determination of serum glutamic oxaloacetic and glutamic pyruvic transaminases. Am J Clin Pathol 1957;28:56-63. 16. Natelson S, Scott MI, Beffa CA. A rapid method for the estimation of urea in biological fluids. Am J Clin Pathol 1952;21:275-81. 17. Caraway WI. Uric acid. In: Seligson D, editor. Standard Methods of Clinical Chemistry. New York: Academic Press; 1963. p. 239-47. 18. Brod J, Sirota JH. The renal clearance of endogenous "creatinine" in man. J Clin Invest 1948;27:645-54. 19. Schneider WC. Determination of nucleic acids in tissues by pentose analysis. In: Colowick SP, Kaplan NO, editor. Methods of Enzymology. New York: Academic Press; 1957. p. 680-4. 20. Ceriotti G. Determination of nucleic acids in animal tissues. J Biol Chem 1955;214:59-70. 21. Burton KA. Study of the conditions and mechanism of the diphenylamine reaction for the calorimetric estimation of deoxyribonucleic acid. J Bio Chem 1956;62:315-23. 22. Hogberg J, Larson RE, Kristoferson A, Orrhenices S. NADPH-dependent reductase solubilized from microsomes by peroxidation and its activity. Biochem Biophys Res Commun 1974;56:836-42. 23. Misra HP, Fridovich I. The role of superoxide anion in the antioxidant of epinephrine and a single assay of superoxide dismutase. J Biol Chem 1972;247:3170-5. 24. Aebi H. Catalase: in vitro. Methods Enzymol 1984;105:121-6. 25. Rotruck JT, Pope AL, Ganther HS. Selenium: Biochemical role as a component of glutathione peroxidase purification and assay. Science 1973;179:588-90. 26. Moran MS, Difierre JW, Mannervik B. Levels of glutathione, glutathione reductase and glutathione-S-transferase activities in rat lung and liver. Biochim Biophys Acta 1972;582:67-78. 27. Omaye ST, Turabull JD, Sauberlich HE. Selected methods for the determination of ascorbic acid in animal cells, tissues and fluids. Methods Enzymol 1979;62:3-11. 28. Osborne TB, Mendel LB. The use of soybean as food. J Biol Chem 1917;32:369-87. 29. Folsch UR, Creutzfeldt W. Adaptation of the pancreas during treatment with enzyme inhibitors in rats and man. Scan J Gastroenterol Suppl 1985;112:54-63. 30. Walgren JL, Mitchell MD, Whiteley LO, Thompson DC. Evaluation of two novel peptide safety markers for exocrine pancreatic toxicity. Toxicol Sci 2007;96:184-93. 31. Frank B, Gottleib K. Amylase normal, lipase elevated: Is it pancreatitis? A case series and review of literature. Am J Gastroenterol 1999;94:463-9. 32. Knight EL, Stampfer MJ, Hankinson SE, Spiegelman D, Curhan GC. The impact of protein intake on renal function decline in women with normal renal function or mild renal insufficiency. Ann Intern Med 2003;138:460-7. 33. Fellstrom B, Danielson BG, Karlstrom B, Lithell H, Ljunghall S, Vessby B. The influence of a high dietary intake of purine-rich animal protein on urinary urate excretion and supersaturation in renal stone disease. Clin Sci (Lond) 1983;64:399-405. 34. Gu CM, Shi YH, Le GW. Effect of dietary protein level and origin on the redox status in the digestive tract of mice. Int J Mol Sci 2008;9:464-75. 35. Gu C, Xu U. Effect of oxidative damage due to excessive protein ingestion on pancreas function in mice. Int J Mol Sci 2010;11:4591-600. 36. Liener IE. Possible adverse effects of soybean anticarcinogens. J Nutr 1995;125:744S-50S. 37. Garlich JD, Nesheim MC. Relationship of fractions of soybeans and a crystalline soybean trypsin inhibitor to the effects of feeding unheated soybean meal to chicks. J Nutr. 1966; 88:100-110. 38. Yen JT, Jensen AH, Simon J. Effect of dietary raw soybean and soybean trypsin inhibitor on trypsin and chymotrypsin activities in the pancreas and in small intestinal juice of growing swine. J Nutr 1977;107:156-65. 39. Crass RA, Morgan GH. The effects of long term feeding of soybean flour diets on pancreatic growth in the rat. Br J Nutr 1982;47:119-29. 40. Mcguiness EE, Morgan RG, Levison DA, Frape DL, Hopwood D, Wormsley KG. The effects of long term feeding of soy flour on rat pancreas. Scand J Gastroenterol 1980;15:497-502. 41. Levison DA, Morgan RG, Brimacombe JS, Hopwood D, Wormsley KG. Carcinogenic effect of di (hydropropyl) nitrosoamine (DHPN) in male wistar rats: Promotion of pancreatic cancer by a Raw soy flour diet. Scand J Gastroenterol 1979;14:217-24. 42. Bell RH Jr, Kuhlmann ET, Jensen RT, Longnecker DS. Overexpression of cholecystokinin receptors in azaserine induced neoplasms of rat pancreas. Cancer Res 1992;52:3295-9. 43. Wu XN. Current concept of pathogenesis of severe acute pancreatitis. World J Gastroenterol 2000;6:32-6. 44. Grant G, Alonso R, Edwards JE, Murray S. Dietary soy beans and kidney beans stimulate secrwetion of cholecystokinin and pancreatic digestive enzymes in 400 day old Hooded -Lister rats but only soy beans induce growth of the pancreas. Pancreas 2000;20:305-12. 45. Liener IE. Soybean protease inhibitors and pancreatic carcinogenesis. J Nutr 1996;126:582-3. 46. Smith JC, Wilson PD, Allen PV, Berry DL. 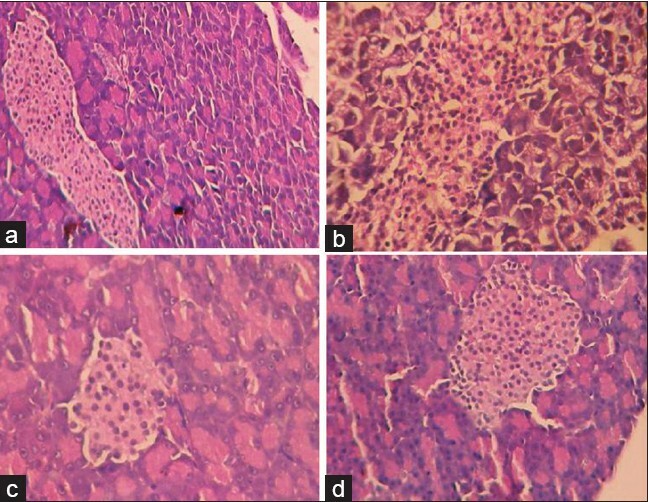 Hypertrophy and Hyperplasis of the rat pancreas produced by short term dietary administration of soy-derived protein and soybean trypsin inhibitior. J Appl Toxicol 1989;9:175-9. 47. Oates PS, Morgan RG. Pancreatic growth and cell turnover in the rat fed raw soy flour. Am J Pathol 1982;108:217-24. 48. Detheloff L, Barr B, Bestervelt L, Steven B, Sigler R, Lagattuta M, Iglesia F. Gabapentin induced mitogenic activity in Rat pancreatic Acinar Cells. Toxicol Sci 2000;55:52-99. 49. Calam J, Bojarski JC, Springer CJ. Raw soy-bean flour increases cholecystokinin release in man. Br J Nutr 1987;58:175-9. 50. Smith JP, Soloman TE, Bagheri S, Kramer S. Cholecystokinin stimulates growth of human pancreatic adenocarcinoma SW-1990. Dig Dis Sci 1990;35:1337-84. 51. Sophia D, Ragavendran P, Arulraj C, Gopalakrishnan VK. High protein diet induced hepatic oxidative stress and its amelioration by the herb, Emilia sonchifolia (L.)DC. PharmacologyOnline 2011;1:149-54.